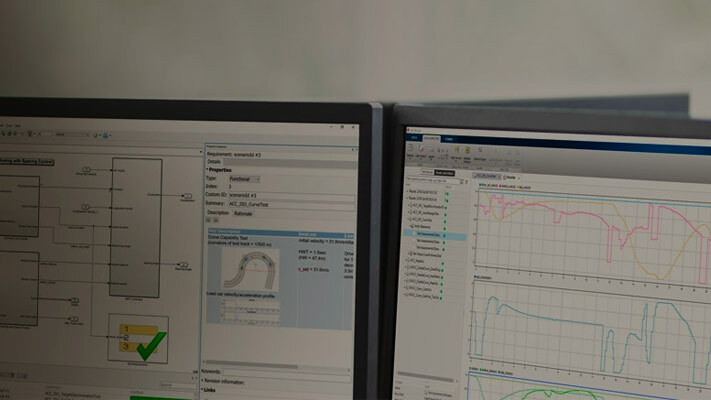 Analyze code to detect errors, check standards compliance, and evaluate key metrics such as length and cyclomatic complexity. Typically for handwritten code, you check for run-time errors with static code analysis and run test cases that evaluate the code against requirements and evaluate code coverage. Based on the results, refine the code and add tests. For generated code, demonstrate that code execution produces equivalent results to the model by using the same test cases and baseline results. Compare the code coverage to the model coverage. Based on test results, add tests and modify the model to regenerate code. From the project, open the model simulinkCruiseErrorAndStandardsExample. Before you generate code from your model, there are steps that you can take to generate code more compliant with MISRA C and more compatible with Polyspace. This example shows how to use the Code Generation Advisor to check your model before generating code. Right-click Compute target speed and select C/C++ > Code Generation Advisor. Select the Code Generation Advisor folder. Add the Polyspace objective. The MISRA C:2012 guidelines objective is already selected. 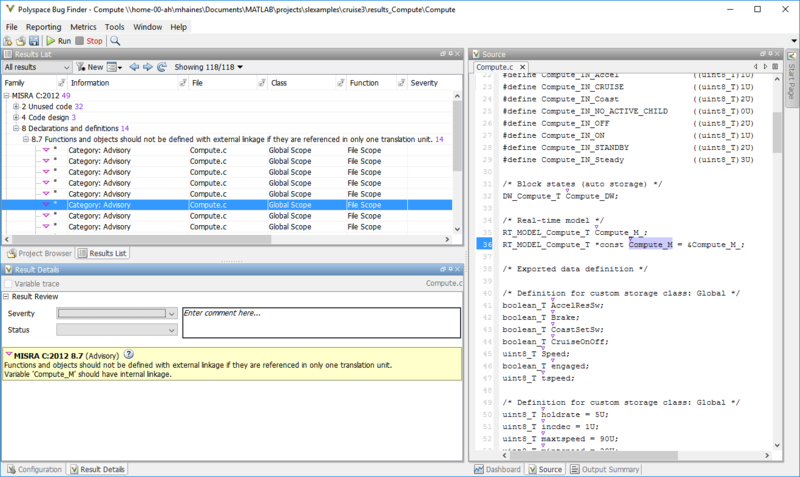 The Code Generation Advisor checks whether there are any blocks or configuration settings that are not recommended for MISRA C:2012 compliance and Polyspace code analysis. For this mode, the check for incompatible blocks passes, but there are some configuration settings that are incompatible with MISRA compliance and Polyspace checking. Click on check that was not passed. Accept the parameter changes by selecting Modify Parameters. Rerun the check by selecting Run This Check. Before you generate code from your model, there are steps you can take to generate code more compliant with MISRA C and more compatible with Polyspace. This example shows you how to use the Model Advisor to check your model further before generating code. For more checking before generating code, you can also run the Modeling Guidelines for MISRA C:2012. At the bottom of the Code Generation Advisor window, select Model Advisor. Under the By Task folder, select the Modeling Guidelines for MISRA C:2012 advisor checks. Click Run Selected Checks and review the results. If any of the tasks fail, make the suggested modifications and rerun the checks until the MISRA modeling guidelines pass. After you have done the model compliance checking, you can now generate code. With Polyspace, you can check your code for compliance with MISRA C:2012 and generate reports to demonstrate compliance with MISRA C:2012. In the Simulink® editor, right-click Compute target speed and select C/C++ > Build This Subsystem. Use the default settings for the tunable parameters and select Build. After the code is generated, right-click Compute target speed and select Polyspace > Options. Click the Configure (Polyspace Bug Finder) button. This option allows you to choose more advanced Polyspace analysis options in the Polyspace configuration window. 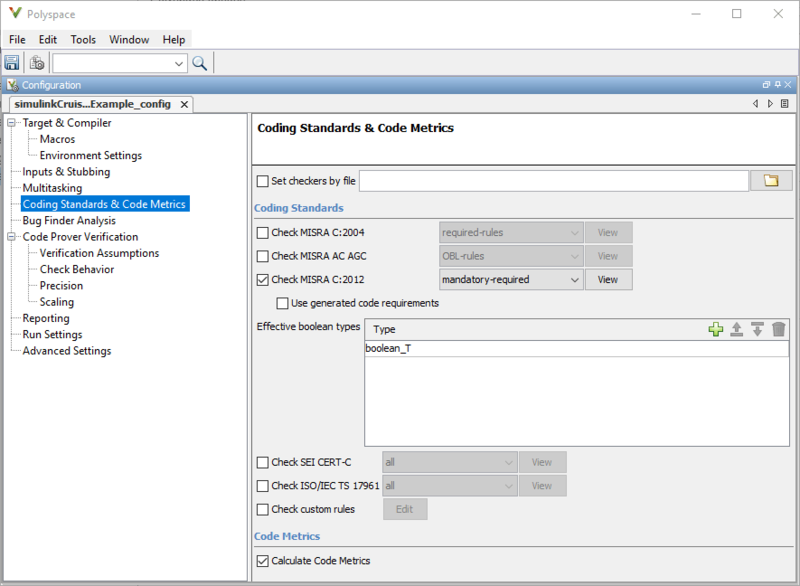 On the same pane, select Calculate Code Metrics. This option turns on code metric calculations for your generated code. Save and close the Polyspace configuration window. From your model, right-click Compute target speed and select Polyspace > Verify Code Generated For > Selected Subsystem. 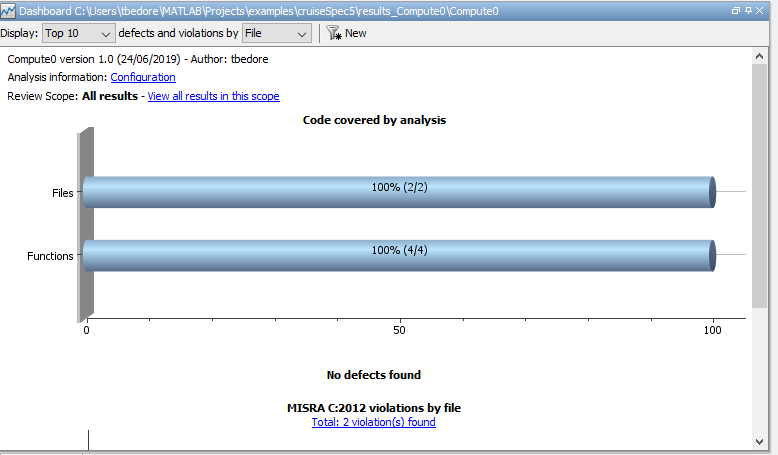 Polyspace Bug Finder™ analyzes the generated code for a subset of MISRA checks and defect checks. You can see the progress of the analysis in the MATLAB Command Window. Once the analysis is finished, the Polyspace environment opens. After you run a Polyspace analysis of your generated code, the Polyspace environment shows you the results of the static code analysis. There are 50 MISRA C:2012 coding rule violations in your generated code. Expand the tree for rule 8.7 and click through the different results. Rule 8.7 states that functions and objects should not be global if the function or object is local. As you click through the 8.7 violations, you can see that these results refer to variables that other components also use, such as CruiseOnOff. You can annotate your code or your model to justify every result. But, because this model is a unit in a larger program, you can also change the configuration of the analysis to check only a subset of MISRA rules. In your model, right-click Compute target speed and select Polyspace > Options. Set the Settings from (Polyspace Bug Finder) option to Project configuration. This option allows you to choose a subset of MISRA rules in the Polyspace configuration. In the Polyspace Configuration window, on the Coding Rules & Code Metrics pane, select the check box Check MISRA C:2012 and from the drop-down list, select single-unit-rules. Now, Polyspace checks only the MISRA C:2012 rules that are applicable to a single unit. Rerun the analysis with the new configuration. When the Polyspace environment reopens, there are no MISRA results, only code metric results. The rules Polyspace showed previously were found because the model was analyzed by itself. When you limited the rules Polyspace checked to the single-unit subset, no violations were found. When this model is integrated with its parent model, you can add the rest of the MISRA C:2012 rules. To demonstrate compliance with MISRA C:2012 and report on your generated code metrics, you must export your results. This section shows you how to generate a report after the analysis. If you want to generate a report every time you run an analysis, see Generate report. If they are not open already, open your results in the Polyspace environment. From the toolbar, select Reporting > Run Report. Select BugFinderSummary as your report type. The report is saved in the same folder as your results. To open the report, select Reporting > Open Report.